View More In Optical Drives - Page 2. Sibaok New Arrival External USB 3.0 CD and DVD Drive Burner Player, you can Burn Files, Install Software, Create Backup Disc and watch CD & DVD Movies, etc..
-- Features USB 3.0 for faster speeds, the CD drive is compatible with USB 2.0. -- Very light weight and small making it portable for you to take anywhere. -- Fully Plug & Play, emergency eject hole, easy to install and use. -- This Drive is tray loading external portable ODD CD which is suitable to USB 2.0/3.0 connector desktop or laptop. -- Compatible WindowsXP/ 2003/ Wind8/ Vista/ 7 /8 /10, Linux, Mac 10 OS systerm, NOT compatible with higher version than OS X Yosemite. -- No extra drive, support plug and play, no need to install the driver program, support plug and play. -- Data cable with pure copper braid process, anti-interference ability, signal attenuation, more stable data transmission. -- Customer's using Windows 10 are advised to Install VLC Media player to Play DVD and CD. -- Before using the CD- ROM drive, be sure your computer has a""Media Player"", make sure Windows media player supports the media format you use. -- There will be problem if your computer has virus, please take steps to kill the virus first. ✿ USB 3.0 HIGH SPEED INTERFACE -- USB 3.0 Ultra slim portable size is equipped with high speed interface, it provides you more faster data transfer speed and more stable data transmission, Meanwhile it is compatible with USB 2.0. 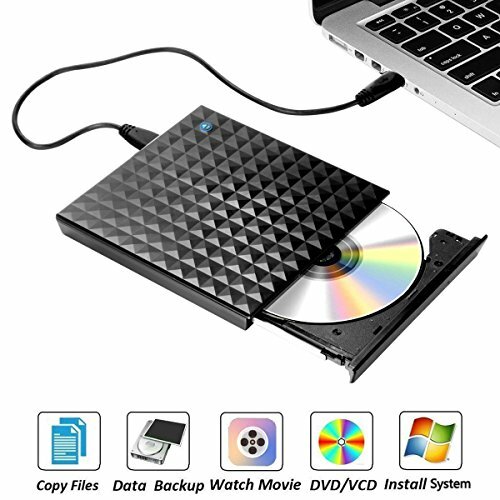 The CD/DVD drive can transfer the data very fast when you use this External CD Drive record CD, music, videos, installing software or create CD/DVD backup disc/CD. ✿ PLUG & PLAY FUNCTION-- Powered by the USB 3.0 port, no external driver required, run automatically after connect to USB port of your mac/ laptops/ desktops. Adopted unique intelligent burning technology, you can burn your disc or interrupt recording at your ease. Pop-up button and disc tray design make it convenient to read or write discs. ✿ EXCELLENT PERFORMANCE -- Support CD, CD-R, CD-RW, DVD-RW, DVD±R, DVD±R DL, DVD±RW and DVD-RAM, strong error correcting ability, anti-shock and noise reduction technology, low power consumption, bring you a better experience. ✿UNIVERSAL COMPATIBILITY -- It is Compatible with various systems such as Windows 98 SE,ME,2000,XP,Vista,,Win 7/8.1/10,Windows Server 2008, 2012, Mac OS 8.6, Mac10 OS, Linux and all versions of Mac OS System and other systems.Support all types of Laptops, Macbook, PC, Desktops. ✿ PORTABLE and STYLISH -- Sibaok 100% risk-free satisfaction guarantee. Any other seller can not provide the same quality product and there is no warranty and service from other seller. If you have any questions about this product by Sibaok, contact us by completing and submitting the form below. If you are looking for a specif part number, please include it with your message.